Continuous release formula promotes lush foliage and abundant harvests. 1 cup (9.6 oz) covers 24 square feet, or 2/3 tablespoon for every 1 square foot of area. For new plantings, mix evenly with soil used to refill planting hole. For existing plants, apply plant food evenly around each plant within the spread of its branches (drip line). Do not concentrate the plant food near the trunk, stem or crown of the plants. Rake plant food into top 1-3 inches of soil or mulch to allow the nutrients to release directly to the root system. After application, water in thoroughly to begin the continuous release feeding process. Always brush or wash granules off the leaves to prevent leaf injury. Grow abundant harvests. 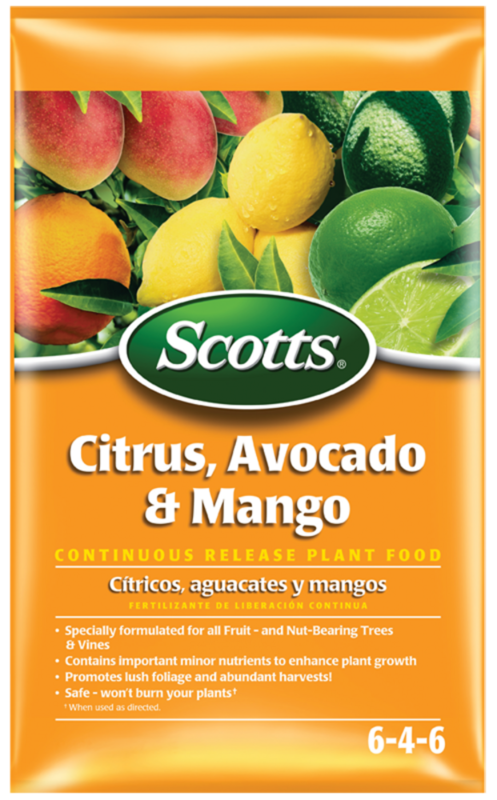 The Scotts formula will deliver nourishment to your plants encouraging vigorous root growth and lush foliage! Great for use on all types of fruit- and nut-bearing trees and vines,including citrus,avocado,mango,apple,peach,pecan,grape,blackberry,raspberry and other fruit trees & vines.